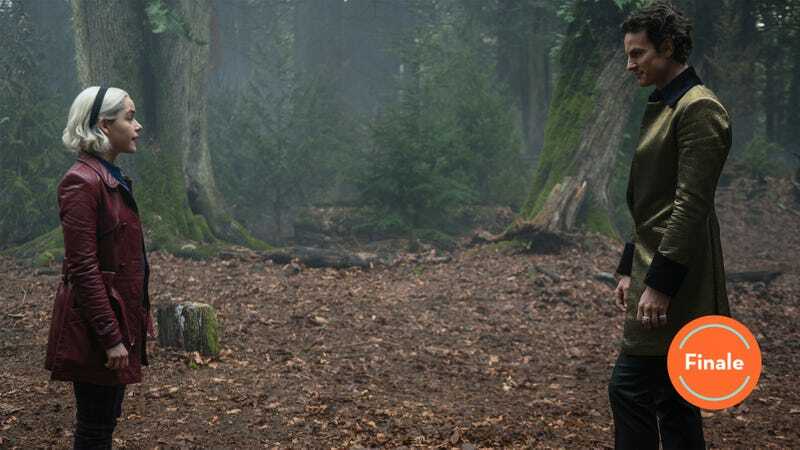 Throughout this long first season of Chilling Adventures of Sabrina, the action occasionally lagged, as various entities moved against Sabrina, who never seemed to quite catch up to who was lining up against her. But that slowness has been completely reversed in later episodes—the action has started to move precipitously fast in the last couple of episodes. In some respects, this is gratifying, in that there’s finally serious forward momentum. But in the finale, it works against the show, as the episode ends up being a little overstuffed. In one episode of television, Sabrina finds out she’s Satan’s daughter, formulates three different plans to stop him, finds out her boyfriend betrayed her, and banishes Satan into the body of her boyfriend with the help of Lilith. And her mortal friends step up and use their various resources to prevent the gates of Hell from opening. It’s a lot of different pieces of plot to move forward in one hour of TV, and the Spellmans spend an inordinate amount of time trying to brainstorm plans that don’t go terribly far. They work hard to protect the home only to have Lilith show up and politely ask Sabrina to leave with her, which she does immediately. And they execute a complex plan to kill or injure Satan, then to at least imprison him, none of which comes through. In fact, it’s only a last minute sacrifice by Nick that saves the day in the end, but all things considered, it is a surprisingly rounded off ending. The twin specters of Father Blackwood and Satan are both vanquished, and Sabrina regains both her powers and her friendships. And Zelda and Lilith get what they’ve always wanted, with Zelda ascending into a new High Priestess role and Lilith getting to rule over Hell, as Satan promised her years ago. Zelda, for all her interest in status and the Church of her youth, has an abrupt about-face on the family religion as soon as Satan gets extra interested in her niece. It’s either noble, or a little hard to believe, that she can so quickly shun the personification of her religion’s deity. And Lilith spends some time going back and forth on whether or not to help the Spellmans, which isn’t really like her—she’s never seemed very indecisive, minus her time with Adam, and now Satan seems to inspire the same inability to take command of her life. But she finally does, and her reward is essentially what she’s waited millennia to have. All she had to do was help imprison Satan in the body of a teenage boy. It’s all so rounded off that it’s almost hard to imagine where the second season of the show will go. There’s so much that happened this season that was framed so entirely around Sabrina’s innocence and her lack of understanding about who she really was, and the community that wouldn’t accept her. It’s easy enough to picture Zelda and Hilda reopening the school for the remaining students, but slightly less clear what those students might actually get taught there. If you get all your magical powers from Satan, but then he’s out of commission, do you pray to Lilith? Considering how much the Spellmans have had to put up with from Lilith, it seems like a bit of a stretch. And a lot of the mystery was tied to the shifting allegiances of the people around Sabrina. With a lot of those conflicts more or less resolved, it’s another potential area the show may have to rebuild. 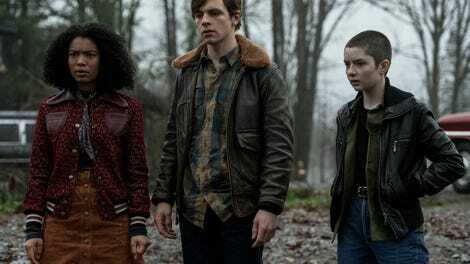 Throughout its first season, CAOS has straddled this odd mix of genres as a gothic, campy teen horror drama. There are not a lot of shows that fit that categorization, which is how you end up with a program where Satan himself lists out a long complicated plan to rule the world with someone, only to have her respond “Sorry, but I have school.” Sometimes this potpourri worked better than others. Many episodes, this one included, have some real clunker lines in them, and it’s hard to determine how much of that is intentional (it’s camp!) versus an effect of the plot getting so complicated they weren’t left with many options. But it’s never boring, it’s visually stunning, and it’s generally a compelling story about an unusual family. Plus, the concept of a revenge plotline starring Prudence and Ambrose should probably be enough to keep most of us coming back for Season 2. I don’t fully understand why Father Blackwood tried to kill the whole church. Sometimes this show really seems to struggle with figuring out exactly how evil its bad guys are. Unintentional laugh line from Sabrina “She was my favorite teacher!” So favorite, in fact, that you didn’t notice she’d had a completely different personality for months? I would appreciate it if they made Kiernan Shipka do like 70 percent less picturesque crying in Season 2. Between “Masquerade” and the opening scene of Umbrella Academy, did Netflix just get a bulk purchase on Phantom of the Opera music? So…what happens to that book of Satan’s that everyone signed? Excellent cat acting this episode. He’s a good judge of character, that Salem.